Sedimentation can be prevented by assuring that a reversible three-dimensional network of sufficient strength is present in the material. Such a network can be introduced by using a suitable rheology additive, often referred to as thickener, in the formulation. In this short series of blog posts focusing on sedimentation stability I will give you some guidance on the key aspects of sedimentation and how to predict it. The strength of a three-dimensional network in a water-based paint can be quantified by determining the yield stress, also called yield value or yield point, of that paint. The yield stress ( in Pa = N/m2) of a paint is the threshold amount of shear stress ( in Pa = N/m2) that can be applied to the paint before the network starts to break down. The network stays intact when the applied shear force is smaller than the yield stress of the paint. The paint behaves as a stable elastic solid as long as the applied stress is weaker than the yield stress of the paint. In practice, this implies that solid particles in a paint will not sink during storage when the yield stress is high enough. Knowing the yield stress of a paint is therefore important when stability against sedimentation must be predicted. A paint with a high yield stress has a strong network inside, thus assuring storage stability. It is not easy to determine the yield stress of a material. Moreover, the value of yield stress that is found depends on the experiment done: different methods give different values. Many materials, including most paints, show viscoelastic behavior. A viscoelastic material behaves partly as an elastic solid and partly as a viscous liquid. Gʹ : the storage modulus, quantifying the elastic (‘solid’) behavior of the material. Gʺ : the loss modulus, quantifying the viscous (‘liquid’) behavior of the material. A material that behaves as a flowing liquid has a G” that is much higher than its G’. The G’ value of a viscoelastic material is a quantification of the strength of the physical network that is present within the system: a high G’ value indicates that the physical network within the system is strong. Sedimentation during storage is a process that takes place at low shear stress for a long time. During storage the physical network must be strong enough to prevent solid particles to sink because of gravity. In order to obtain information about viscoelastic materials, like paints and pigment dispersions, often oscillatory tests are done in which the applied shear stress is slowly increased, using constant frequency. Then Gʹ and Gʺ are plotted against shear stress , Figure 1. Both Gʹ and Gʺ differ from zero when the material is viscoelastic. FIGURE 1: Behavior of Gʹ and Gʺ of a viscoelastic material with a gel structure. The first pre-condition for having stability against sedimentation is that the material is a gel. This implies that the viscoelastic material shows more elastic (‘solid’) behavior than viscous (‘liquid’) behavior: G’ of a gel is higher than its G”. Secondly, both Gʹ and Gʺ must be constant at low shear stress, implying that both properties are independent of shear stress. At a certain shear stress level, the linear behavior of Gʹ is lost. 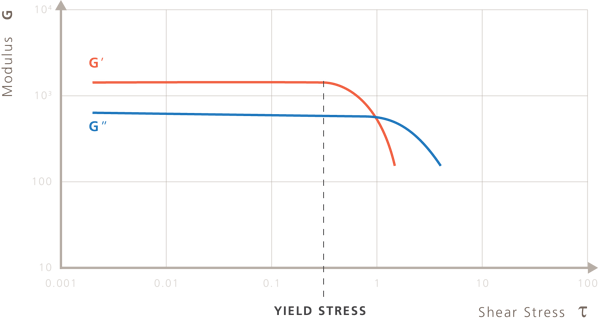 The yield stress of a material ( ) is the value of the shear stress applied when G’ starts to deviate from being constant, Figure 1. The reversible elastic behavior is lost when the applied shear stress exceeds the yield stress of the material. 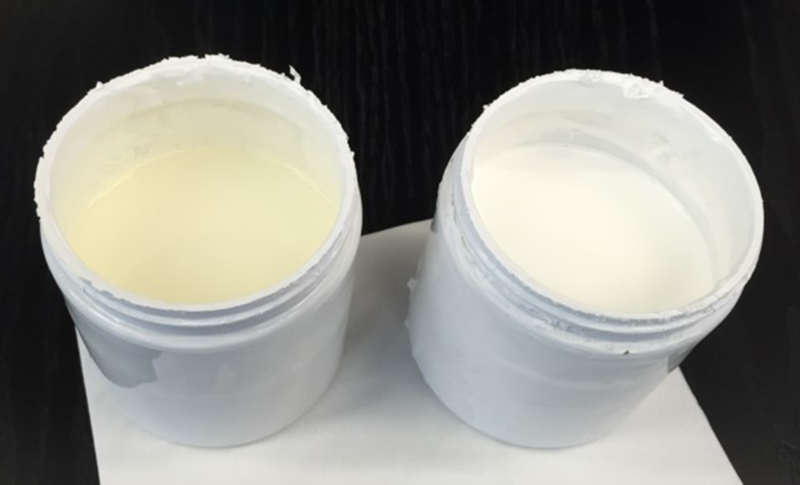 The higher the G’ value of a paint (in the region in which G’ is constant) and the higher its yield stress, the stronger its resistance against sedimentation. The values of G’ and yield stress of a material that are measured depend on the history of the material and on how the measurement was done. It is therefore important to always specify how the experiment was carried out. In the next Blog Post we will discuss what this theory about sedimentation stability means in practice. We will discuss yield stress and storage modulus of waterbased white pigment dispersions, as used in the coatings industry. 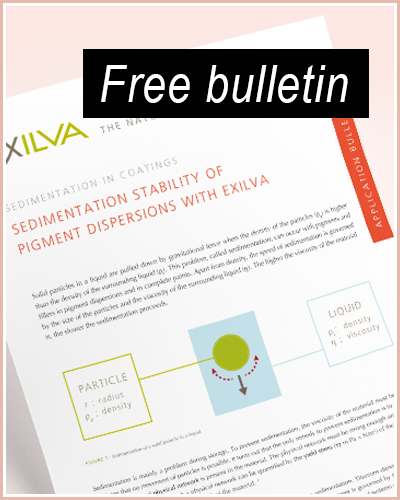 We will show how both key properties are influenced by using Exilva, a bio-based rheology additive designed for waterbased paints and pigment dispersions. 1. The Rheology Handbook, Thomas G. Mezger, 4th edition, 2014. Drs. Jochum Beetsma graduated in physical chemistry from the University of Groningen. He worked at PPG on the development of Industrial Coatings and at DSM Coating Resins on Emulsion Systems, Powder Coatings, High Solids, Additives and complete formulations. Since 2004 Jochum is independent consultant for companies in coating and ink industry. 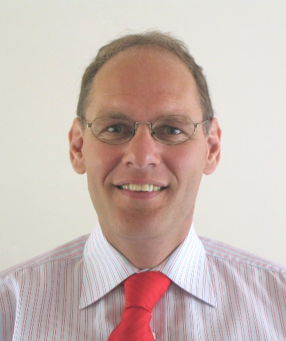 He is member of the SpecialChem Expert Team. Jochum writes technical articles on coatings for UL Prospector.